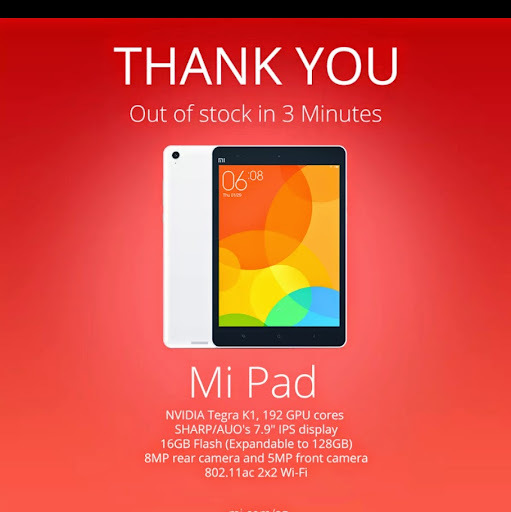 [NEWS] So Mi Pad made its way to Singapore only after almost a year of sales in China, and all it took was 3 mins to sell out. I first featured this Android tablet Link in May 2014! At S$299, it's the best tablet you can buy with the likes of iPad Mini, Air and Samsung Tab Pro all going for a higher price. However only the 16GB white version is available on shore Singapore. Plus it is out of stock at the moment. To get it, you have to join in the next batch of release by Xiaomi Singapore. Which really is holding back sales numbers. Xiaomi always maintained it is due to their limited manufacturing capacity but speculation says its marketing tactics. And really, with just 16GB model they are losing out on even more sales given 16GB isn't much by any stretch of imagination. Ouch!